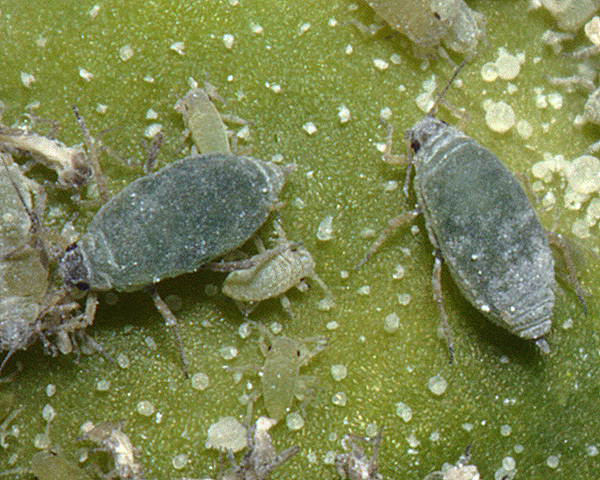 Hayhurstia are medium-sized aphids, with very small slightly swollen siphunculi. The siphunculi have a small flange and are distinctly shorter than the cauda. The cauda is finger-shaped. There is only one species in the Hayhurstia genus. It feeds on members of the amaranth family (Amaranthaceae). They have a sexual stage in the life cycle overwintering as eggs, but there is no host alternation. The single species is thought to be an important vector of plant viruses. These viruses result in considerable yield loss of peppers (Capsicum species) and potatoes (Solanum tuberosum). Hayhurstia atriplicis live on orache (Atriplex) or goosefoot (Chenopodium) inside yellowish pseudogalls (see first picture below). 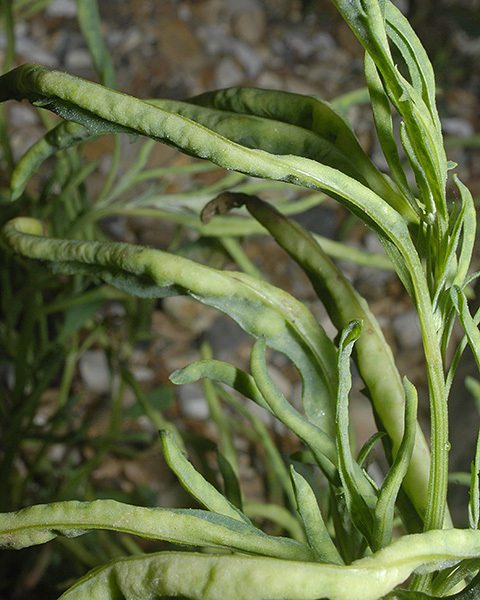 The pseudogalls are formed by rolling the leaves upwards. Hayhurstia atriplicis apterae are green covered with a white wax powder (see picture below). Their siphunculi are very small and slightly swollen with a small flange, and are distinctly shorter than the finger-shaped cauda. The body length of an adult aptera of Hayhurstia atriplicis is 1.5-2.9 mm. Hayhurstia atriplicis feeds on many different species of plants in the goosefoot family, especially Atriplex and Chenopodium. In temperate climates Hayhurstia atriplicis has a sexual stage in the life cycle overwintering as eggs, but there is no host alternation. It is found widely in Europe and Asia, north and central Africa, and in North and central America.